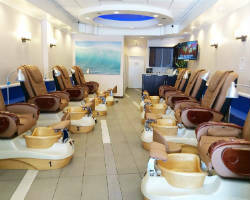 20 Lounge is a very new branch of sophisticated boutique nail bar in San Diego. With a philosophy of a place of convenience and affordable luxury, Club 20 members and guests received advanced nail services, certified waxing and facial care. Only the top brands of Dermalogica and MicroZone are used. Guests are also offered of the amenities from a fashion-forward retail boutique at 20 Lounge. For an optimal San Diego nail salon experience, a membership and loyalty program is given at Club 20 for loads of great deals, discounts and VIP treatment. Bellissima Day Spa specializes in health and beauty treatments that are European inspired. Rejuvenate and replenish your skin at this place of elegance. At Bellissima, the main goal is to relieve you using a therapeutic stress reduction treatment. Where, only marine and botanical ingredients are applied. To name some, these are herbal oils, sea salts, algae, plankton, seaweed and essential oils. Bellissima believes that these extracts emanate a natural energy to illuminate the body. Enjoy hand and foot treatments like the paraffin pedicure and aromatherapy French Spa Pedicure or their nail salon with customized variations of nail care packages. Imagine a place and a day where you can slow down things and ultimately relax. Ultra Lux Day Spa can make any bride look stunning as ever in the best salon features known, today. The façade stands magnificently on a spacious floor and creative interior designs. 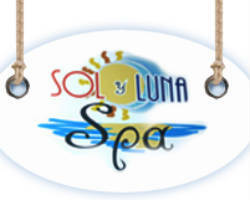 Ultra Lux Day Spa is located in close proximity to the Poway and Scripps Ranch. Where, each guest to walk inside its doors is given special care and attention. The team will answer to your needs and desires, then endow quality services that matter. The Nails Club is a San Diego based nail salon. An expert to health and beauty, TNC has the ultimate facilities to take care of your hand and feet. Now, you can bid goodbye to all microbes and germs by using spa chairs and the world of CONTÉGO, a disposable pedicure system that assures guest’s safety. This local hangout provides unique packages to suit all ages from old, middle age to young, name it they have it. Fill up your own client profile now and adhere yourself to a new dimension of nail arts. Get more in love at Moon Nail Spa. Sit back, get pampered and kiss juicy nails, be a star at this top salon. Moon Nail Spa is owned by Luna Tran. She started serving guests with nail care needs in 1989 and, then, eventually branched out to be a full-service nail spa house that also offers cheap facial and waxing packages. For a more dramatic effect and satire look, Moon Nail Spa can make any bride look fantastic. Additional offers of air brush and tattoo nail designs for all seasons are also available. Sugar & Spice Studio is a very simple nail and body waxing salon found at the heart of North Park. 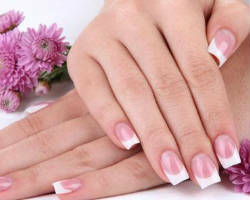 Get to try the different variations of basic nail artistry and designs by a team of experts well known for their craft. When you march down the aisle, think of how long your gown is, the way your hair softly flows, the pretty flowers of bouquet and the new set of nails irresistible not to look at. Sugar & Spice Studio is a primal nail art connoisseur among nail salons in San Diego. 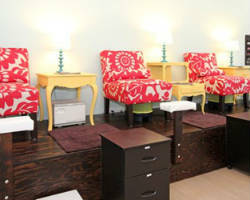 Reviews have recognized the quality services found at Smart Nails & Spa in a corner of San Diego. Do you think of becoming more and more beautiful? Then, Smart Nails & Spa is the perfect choice. They have everything that concerns nail care. For a classic, oriental and, as well, modern nail care range of features, this superb joint welcomes its guests with a beneficial and harmonious environment to suit your own fervors from a nail spa. Drop a “Get near me!” sign at your fingertips and leave Smart Nails & Spa with lovely nails. Started in December 1, 2007, Salon Serendipity is a full service salon, made up of a group of independent contractors. Together, they have been a favorite choice of beauty and health rejuvenation during parties, meetings and weddings for bringing friends, family and love ones in a glorious spa day. Find a dedicated team, exceptional service, high quality and a non-clinical environment to spoil guests across nail salons at San Diego, CA. Specific salon services are hair care, skin care and nail care services. See the elements of chic, ingenuity and artistry in excellence at Salon Sol. This great place knows nail designs in different variations of classic, modern and eclectic craze, all suiting to the each unique tastes of guests. Inside, get to see a group of proficient nail experts gifted with skillfulness and craftsmanship to use magical hands on the most beautiful bride. Get to enjoy a customize range of salon offers in California like Bosley certified hair loss specialist, medical spa treatments and Japanese straightening.